At the beginning of the year, I had the pleasure of photographing a lovely shop in Bath just round the corner from the offices where I work. The shop will be an absolute haven for anybody, like me, who’s slightly too obsessed with fabric for their own good. I had been commissioned to photograph and write a piece on the wonderful Country Threads for Love Quilting and Patchwork Magazine – a bookazine from my company’s craft portfolio. Writing about and photographing shops is something I’m only too familiar with from my work on the Cardiff Arcades Project, so I pretty much felt at home with this, and being what I call a “now and then” crafter, it was also pretty awesome to be surrounded by all the pretty patterns and colours. While I was there I got chatting to the wonderful owner of the shop, Jan, who opened the shop nearly twenty years ago. 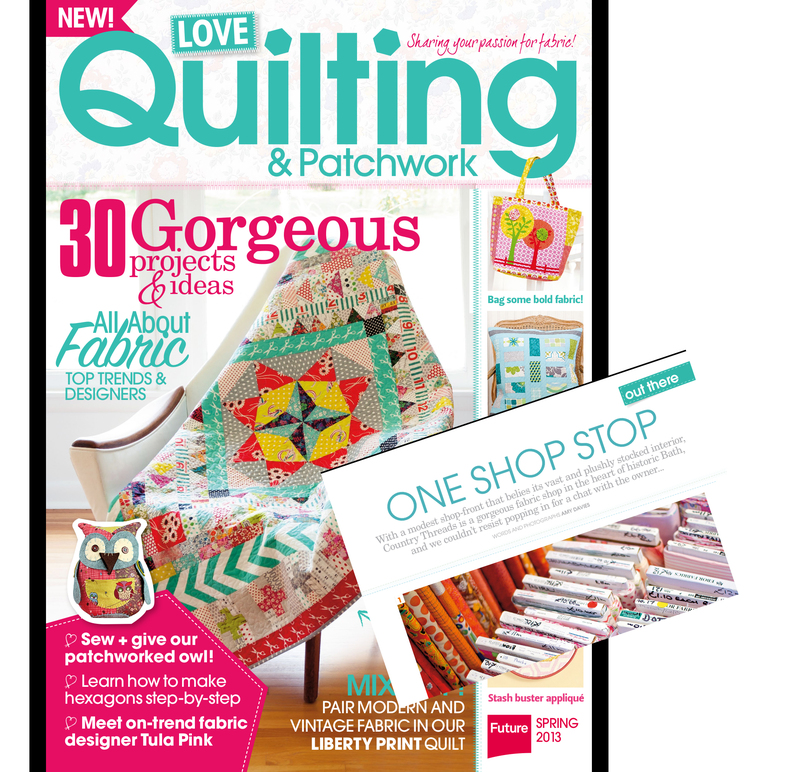 Unfortunately, getting hold of a print copy of Love Quilting and Patchwork here in the UK is a little tricky now as (not that the publishers are going to be complaining) it’s sold out. However, we live in the 21st century and that means you can get your peepers around a lovely digital copy… if you’ve got one of those new fangled iPad things, you can read it in the Cross Stitcher container app, downloadable from Newstand here. You can also find the lovely guys who make it over on Facebook and Twitter, where they share all kinds of loveliness on a daily basis. Who wouldn’t want that? I loved seeing how this turned out when the finished article was put together. I got a little thrill when I saw “Words and Photographs” in my byline. Although I’ve had hundreds (probably nudging over the thousand, wowsers, how did that happen?) of bylines by now, it always raises a smile to see my own name in print… and that added “and Photographs” made this even more special than normal. I’m a bit sappy, sometimes. Below you’ll find the pictures that I took in the wonderful store – I hope you like them, and if you find yourself in the South West and fancy losing an hour (who am I kidding – it will be longer) to the lures of fabric heaven, make sure you pop in. Visit the Country Threads website for more details about opening hours and all that jazz. Oh my goodness this is bordering on naughty. 🙂 The ribbons!! When I go to Bath next I know where I’ll be emptying my pockets. Thanks for sharing! Gorgeous blog post! I went hunting for the magazine and managed to find 4 copies in my local WH Smith!